Sometimes missing a deadline is necessary... like when one is sewing at midnight before the last day of school and decides that staying up until 4am to finish would not be wise. 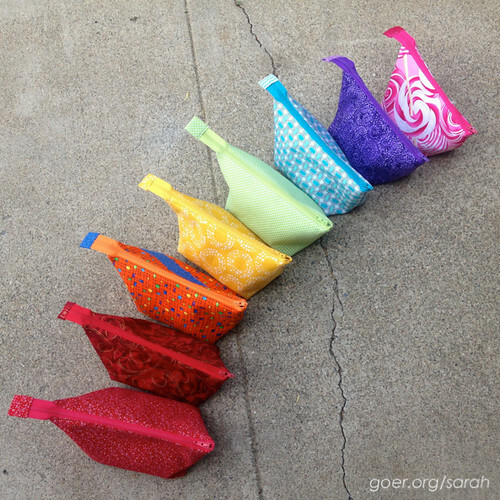 Instead the kids and I delivered eight open wide zipper pouches (size small) a couple weeks after the end of the year. Fabric choices were driven by what color zippers I had on hand. We ended up with a rainbow selection and chose fabrics accordingly. The orange pouch has a blue stripe on one side, simply because I was a bit short on the amount of orange fabric. One or two of the others were cut 1/2" to 1" narrower than the pattern for the same reason. Everything came from my stash. Yay! Posted in Sewing. Tags: open wide zipper pouch, sewmystash2015 on July 22, 2015 by sarah. Cute! These are on my "to make" list. Thanks for visiting, Karin. The directions are great and they go together easily. I've made over a dozen now. Go for it! Hi Sarah, your open wide zippered pouches turned out great. I love all the colored zippers. A great way to use your stash of fabric and notions. Since my kids are in their late 20's, it has been awhile since I made teacher gifts. I remember that the best received gifts were the year I made polar fleece socks for all the kids' middle school teachers. I had just purchased my first serger. I had to guess in the range of sock sizes what would fit all the teachers' feet. I got very lucky and they all fit. I have grandkids now, and my DIL has a vinyl business and she heatpressed the teachers' last names in vinyl to scarves last year for Christmas and also has made travel mugs with names on them. I think I would use the open wide pouches myself as you could fill them with so many neat goodies from the dollar stores. Thanks for sharing. Those are all such fun gift ideas. I was a teacher for 11 years. Weirdest gift I got was shampoo and conditioner (and very utilitarian, not fancy or scented or anything). I have a design idea for a different style zippered pouch, so they will probably all get that one next year. ;-) Thanks for visiting, Shelley. I considered it sanity saving. ;-) Honestly, I figured the teachers didn't care if the gifts came the last day of school or a couple weeks later. Thanks for visiting, Fawn. I like these. Make neat gifts!! Thanks, Bo. I need to make some more to have on hand for upcoming gift giving. The kids both love theirs. My daughter keeps her baby doll bottles in hers and my son keeps some small animal figures in his. I love the open wide pouches. I was a bit addicted last fall. Great fabric choices - so bright and vibrant. So easy to be addicted! I enjoyed doing a bunch at once assembly line style. 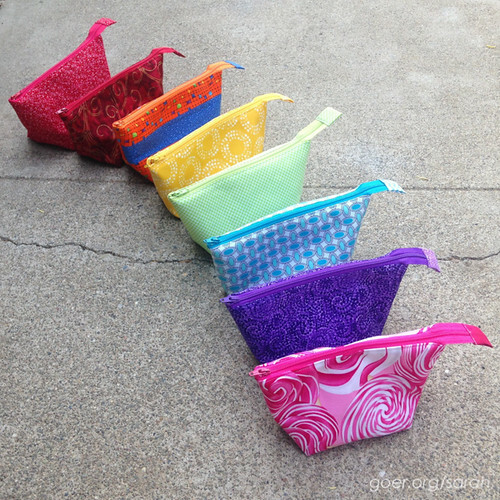 Love your pictures of the rainbow pouches. :) I have only started doing handmade teacher gifts. But this year my son and I made little paper dolls for a scrapbook for his teacher who was retiring after 20 years. A pouch would have been so much faster than the 50 we cut out and glued together!